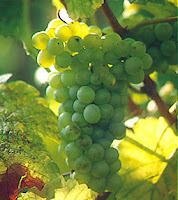 Pinot Blanc is a white grape that is a genetic mutation of Pinot Gris, which is itself a mutation of Pinot Noir. This variety is best known in northern European regions like Alsace, most of northern Italy, and in parts of Germany. Pinot Blanc gives a wine with fruity aromas, often of apples and melons, but it does not have very distinctive characteristics. It is rather high in acidity. Pinot blanc wines are usually made for immediate consumption and seldom meant for cellaring. Clones of Pinot Blanc vary in vine vigor and fruit production capacity, but all clones are characteristically high in acid and low in aromatic intensity. Generally oak is not used in the maturation process of Pinot Blanc.